Win a copy of Edward Haletky’s new book » Welcome to vSphere-land! I recently received an extra copy of Edward Haletky’s new book that was just released, VMware ESX and ESXi in the Enterprise. 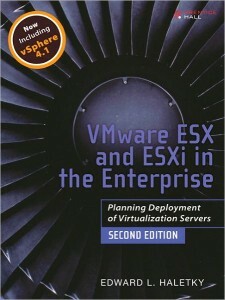 This is a second edition of his original book and covers up to vSphere 4.1. I was trying to think of a contest idea to give my extra copy away and thought I would keep it simple. I have a number between 1 and 100 the first one to guess it in the comments wins it. Only one guess per person, I have your IP addresses so no cheating, make sure you leave a valid email address in the appropriate field, it isn’t published so nobody sees it. Let the guessing begin! 25, the other number used in your post. OK, We have a winner, the answer to life the universe and everything – 42. Congrats Eric Wright!